Prince Genji came to exile in Suma and performed a purification ritual upon his arrival there on the seventh day of the third month, jooshi 上巳 (of the lunar calendar), on the day of the snake (mi no hi 巳の日). Now celebrated on March 3. While the ceremony was not yet finished, a strong rain started and thunder roared. So all left for shelter in a hurry.
. . . The beach was doted with a few fisherman's huts and a dilapidated Lotus Flower temple. We drank tea, warmed up sake, and were overwhelmed by the loneliness of the evening. According to Basho's journal, this haiku alludes to the fact that Suma was the site of a fierce battle between the Genji and Heike clans in the 12th century. Suma no ama is most probably one of the female divers.
. WKD : The Flute and Haiku .
. . . CLICK here for Photos of the temple ! "The Narrow Road to the Deep North"
Sabishisa ya... (Lonlier I thought). The season word is aki indicating autumn. The line hama no aki is short for Ironohama no aki. The autumn scene at Ironohama is full of bitter-sweet melancholy. The autumn scene at Ironohama is full of bitter-sweet melancholy. In the past the beach at Suma was considered melancholy as mentioned in The Tale of Genji, In the No play Matsukaze, and in the accounts of the battle at Ichinotani. The poem says, "I myself am familiar with autumn at Suma, but this is more melancholy still." "At Suma melancholy autumn winds were blowing. Genji's house was some distance from the sea, but at night the wind that blew over the barriers, now as in Yukihira's day, seemed to bring the surf to his bedside. Autumn was hushed and lonely at a place of exile." is a word of judgement used in awarding the prize in a poetry competition. 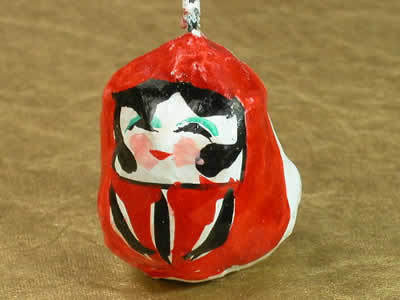 Basho is comparing the melancholy autumn of Suma and Ironohama as though they were works of art. The particle ni makes the comparative element clear. 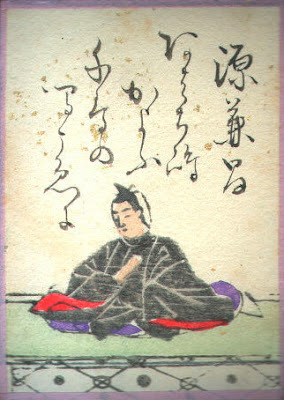 Basho opens the poem dramatically with the line Sabishisa ya. Then he compares the two locations and gives the award for autumn melancholy to Ironohama. This opening line is characteristic of Basho as we see in other poems which begin Shizukasa ya or Suzushisa ya or Arigata ya, etc. We hear echoes of the Genji throughout this passage, but I wonder if we also hear Kamo no Chomei when he wrote in Mumyosho that the height of elegance was weeping tears while watching evening fall. Is autumn on this shore. On the sea before me. Until not so long ago, Suma bay, west of Kobe, was one of the most famous scenic spots in ancient Japan, a landscape characterized by pine trees and white sandy beaches. 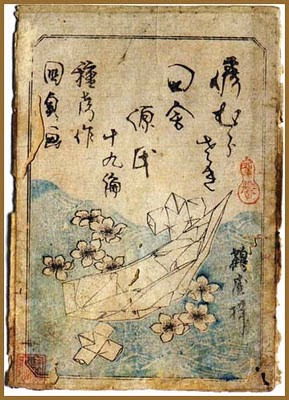 Suma is already an important poetic subject in the 8th century Manyoshu anthology and is also the name of a chapter in the Genji Monogatari. Since the Heian-period, the beach has been poetically associated with the full moon of autumn. Apparently, it was quite a lonely place that inspired susceptible visitors to a melancholy mood. On top of that, Suma was the location of a dramatic battle of the Taira-Minamoto wars of 1180-85, later celebrated in the Heike Monogatari. Basho traveled here in 1688 in search of those poetic allusions and was followed by Buson, Shiki and Hosai. Sumadera, not far from the coast, is an old, esoteric temple that still attracts a flourishing folklore of religious customs. 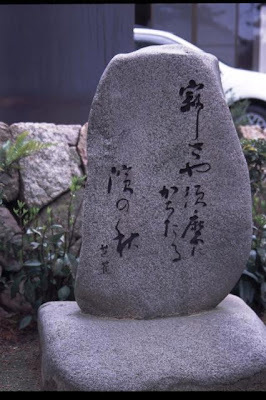 The grounds are graced by many haiku stones as well as tanka poems. More kuhi can be found in Suma-ura Park, which is perhaps the closest one can get to the beach that has now been buried under a highway. Suma temple is one of the oldest temples in the Kobe area and still very popular with worshipers. 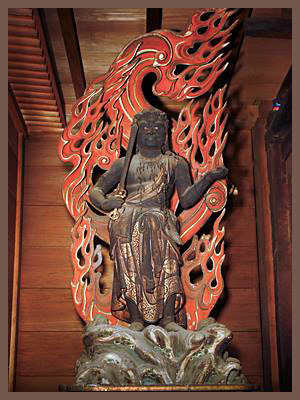 It belongs to Shingon Buddhism and is dedicated to Kannon, the Goddess of Mercy. The extensive grounds are full to the brim with monuments, from haiku stones to quaint Buddhas and Jizos, modern memorials and statues. It is veritable storehouse of historical, literary and popular religious lore and I come here after seeing the kuhi in Suma-ura Park.
. Tsunashiki Tenmangu Shrine 綱敷天満宮 . from a store in Suma, Kobe. is the great head temple of Harima group of Shingon Buddhism, which principal image is Shokannon. 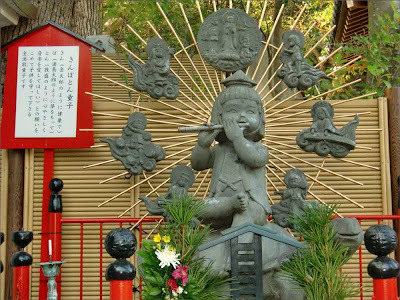 It is said that fishermen raised Shokannon statue offshore and Monkyo-shonin relocated it to the current place in Heian period; people believe that this episode is the beginning of the temple. The temple is known across the country as an old and famous temple that is deeply related to Genji family and Heike family. 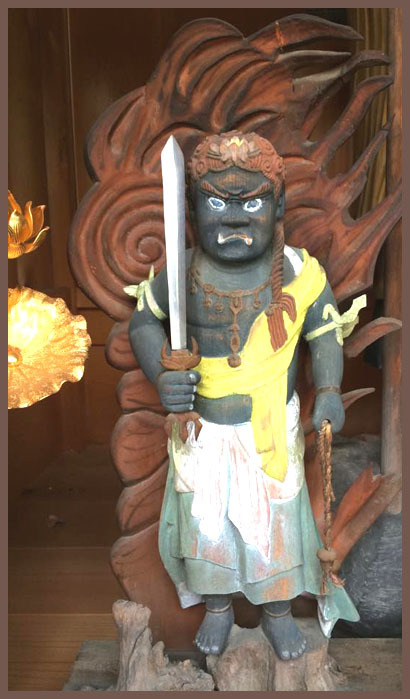 Thus, there are a large number of historical sites lincluding "the Flute of Aoba" cherished by deceased Atsumori Taira-no, a bell of Benkei, a mound of Atsumori's head, pine which Yoshitsune sat on. Those who visited here in remembrance of Genji family and Heike family, include many literary people and there are stelae of Haiku read by Masaoka Shiki and Matsuo Basho inside the temple. Although its formal name is "Joyasan Fukushoji", the temple has been called "Harima-dera" from the past and been familiar to people through the ages.
. aoba no fue 青葉の笛 flute with green leaves .